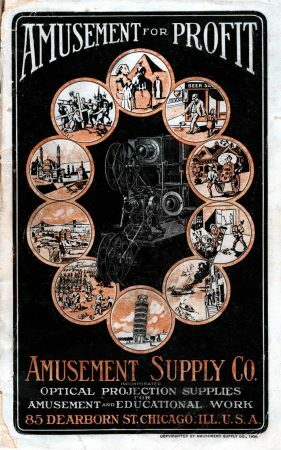 It’s a long, epic story that takes us from the pages of this catalog to the cinema multiplexes of today: the story of Moving Pictures. Even as Hollywood celebrates 90 years of Oscars, it’s worth remembering that motion pictures had been around for 35 years before those first Academy awards. But the early movie environment would be nearly unrecognizable to us. Films in 1906 were short – sometimes less than a minute; almost never longer than 10 minutes — and an evening’s amusements might string together multiple subjects both factual and fictional. Anything that moved was fair game: be it parades, distant lands, or early dramas like The Great Train Robbery. 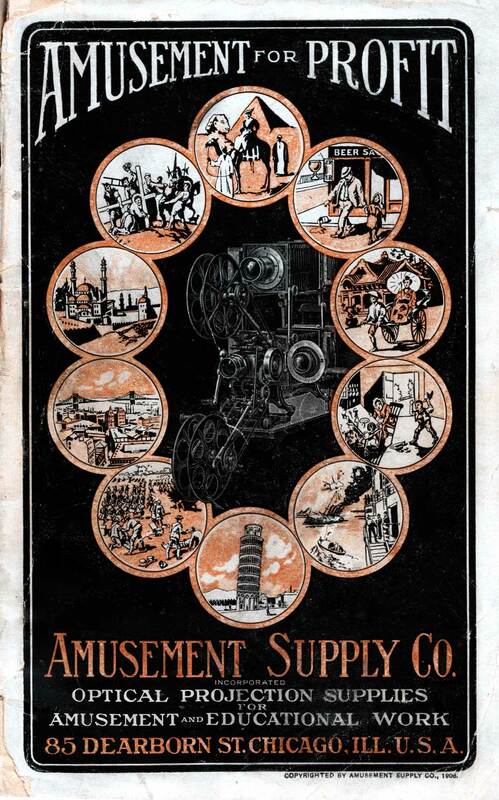 Movies were often tacked on to vaudeville shows as an added attraction. Other entrepreneurs travelled from village to town with a projector like this and cans of movie film, setting up for a night or two to entertain the locals with a movie version of the “Life of Christ” or perhaps “The Whole Dam Family and the Dam Dog“, depending on the public’s tastes. And in 1906 a few buildings were being converted to show movies – charging a nickel’s admission and becoming known as Nickelodeons. 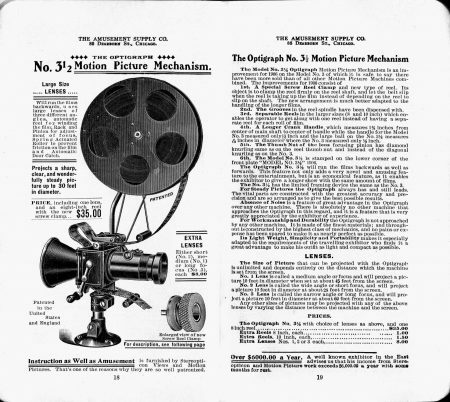 The Amusement Supply Company would sell you both projection equipment like this Optigraph projector, and the films themselves. Those who understand projectors may notice a few pieces missing from the etching – both the light source and takeup reels were extra. (It’s well worth clicking on the picture to see and read about it.) Takeup reels were actually considered optional – many locations just let the film unspool into a bin on the floor and then rewinding it. If you didn’t trust the new-fangled films, the catalog also sold gramophones to play music and stereopticons for showing slides. But it was movies that were pictured on the cover and were felt to be the future. Yes, quite a story…in fact, it would make a good movie.